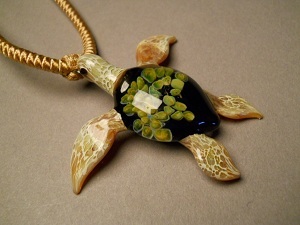 This glass Sea Turtle pendant necklace has a Tide Pool Turtle Shell. The blown glass pendant is one of my favorite jewelry items in our gallery. Glass and Fire has been making hand blown glass jewelry for some time now and we especially like making sea life jewelry. 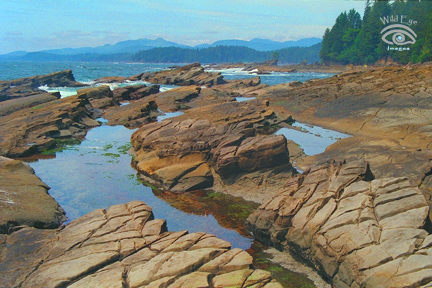 One time a few years ago while walking along the West Coast Trail on Vancouver Island in British Columbia on a 9 day backpack trip we came across some of the most amazing sights. 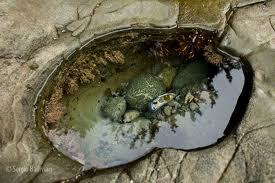 One of them that fascinated me was the "Tide Pools" left behind while the tide of the Ocean was out. This inspired what I call the Tide Pool series Sea Turtle. In its shell you can see one of the Tide pools. I have done sculptures and many different sea turtle with the implosion in the sell and it has the look of something that you might see in the ocean or in one of the "Tide Pools". Below is a picture of the area where we hiked and some of the pools that we had seen. SHIPPING: ALL JEWELRY SHIPPED USPS IN US.